Already planning your big Summer escape?! Stand out from the crowd with one of these luxurious luggage options and take the stress out of packing and travelling. If you’ve ever gone on holiday with a suitcase which didn’t spin, then you’ll know how handy the spinner wheels come in when you can effortlessly saunter through the airport with your luggage by your side instead of trying to lug it behind you as it trips you up! The gorgeous new Ted Baker Take Flight Medium Spinner is the ultimate luggage accessory for the stylish traveller. Weighing in at just 3.65kg to make sure you make use of every bit of that 20kg allowance, the Take Flight case is part of the stunning newly launched hard side collection with printed front panel and colour update on the Porcelain Rose design from last year. Elegant, soft and feminine in burgundy and pink, the Medium Spinner features rose gold TB branded locking mechanism, inner lining featuring the Ted Baker signature print and clear plastic inner luggage case so you can see where everything is without unpacking every item. Other features include a faux leather ergonomic hand grip, bespoke trolley system and ultimate 360° smooth rolling wheels for ultimate ease and manoeuvrability. Available from Case Luggage, originally £265, now £198. Luxuria Lifestyle were one of the first to trial this revolutionary new luggage system, now available at Harrods. Dutch brand Bugaboo, famous for their buggy range and Bugaboo Boxer, have launched the Boxer Cabin Case PURE®. The steering remains light, even when cases are packed full, while the PURE® advanced unbreakable material with matte finish, is designed to take impact, protecting against surface damage and ensuring your case stays in pristine condition. The Bugaboo Boxer Cabin Case PURE® is is the perfect accompaniment to the Bugaboo Boxer, connecting easily to the existing chassis or the actual Boxer travel case itself. 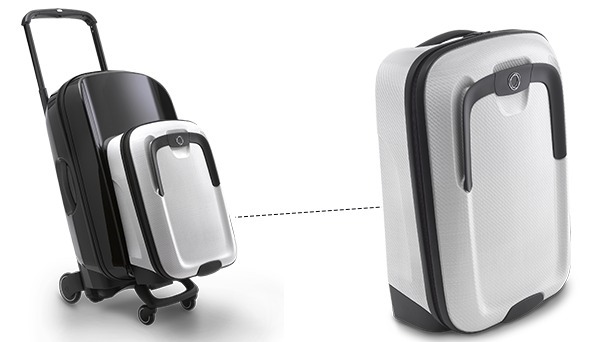 Say goodbye to wheeling around multiple heavy cases, check in your Travel Case and take your Cabin Case on as hang luggage with retractable wheels. For the very best in aesthetics, durability and organisation, look no further than this superb range.